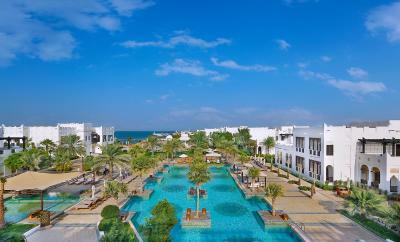 Lock in a great price for Sharq Village & Spa, a Ritz-Carlton Hotel – rated 8.9 by recent guests! The inside was beautiful, their breakfast buffet was great, and the spa was amazing and very relaxing. 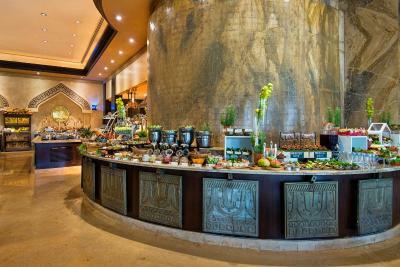 Buffet is amazing, selection of local and seafood. Beautiful hotel from outside to inside. We stayed here on a 19 hour stopover on the way home, very, very comfortable, great staff and very good food. They also have a lovely spa that is definitely worth going to, easy to get to from the airport too. The facilities were like home away from home. The staff in every area of the facilities were attentive to every need. Having a resort situated on the water with a nice beach was a large determining factor in staying here. The food and quality there of at the main restaurant were superb. Bed and linen were exceptionally soft and welcoming. The fruit bowl in the room was abundant and the fruit selection was sweet. The jacuzzi bath albeit only for one was divine as it bubbled and massaged my skin. 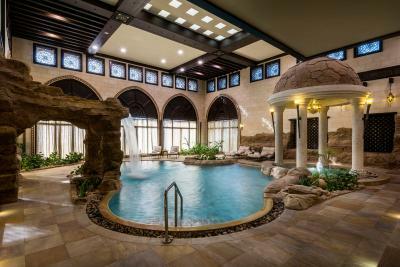 The spa service received was the best Hamam experience I’ve had in Doha! All staff were super friendly and helpful, I got the early check in and late check out free of charge! The room service checked on me twice in case I needed extra water or extra towels. The pool staff were super happy and helpful i also saw them entertaining young kids by the pool. 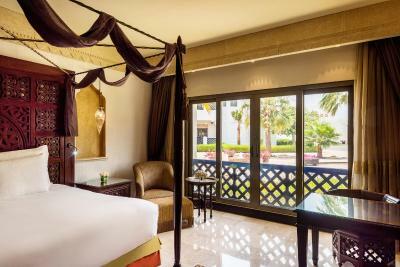 Sharq Village & Spa, a Ritz-Carlton Hotel This rating is a reflection of how the property compares to the industry standard when it comes to price, facilities and services available. It's based on a self-evaluation by the property. Use this rating to help choose your stay! 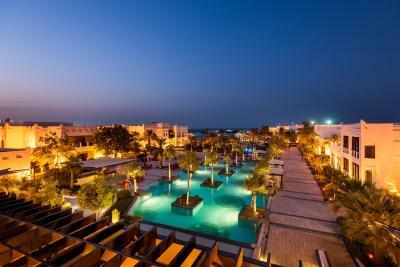 Sharq Village & Spa, a Ritz-Carlton Hotel is a luxury beachfront property overlooking Doha Bay. 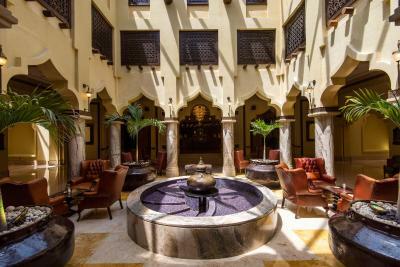 This secluded 174-room resort blends authentic Arabian architecture with the very latest in modern comforts and amenities. Spread out along 1,150 feet of coastline property, it features a 1,400-m² infinity pool and extensive wellness center. 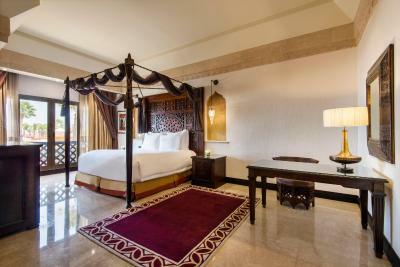 Rooms at Sharq Village feature an oriental décor, wooden ornaments and canopied beds. They come with a private balcony overlooking the resort village or Doha Bay. The marble bathroom has a deep-soaking bath and a rain shower. The Spa, covering a sweeping 21 ft², offers an extensive menu of skin therapies and massages. Guests can rest on comfortable loungers in the lantern-lit relaxation area or enter the hammam and sauna. Guests can enjoy an exciting style of contemporary Persian delights at its finest at Parisa Restaurant with sea views overlooking Doha Bay for memorable dining experiences in an elegant, stylish ambiance. 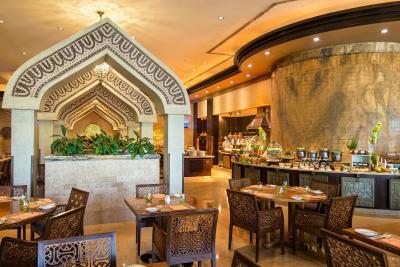 Al Liwan grill restaurant features a wide range of buffets, from Lebanese to seafoods to brunch options. Hamad International Airport is 5 minutes’ drive away and private parking is free. When would you like to stay at Sharq Village & Spa, a Ritz-Carlton Hotel? These rooms feature secluded terraces with views of the village courtyards, gardens and fountains. This large suite has a balcony overlooking the resort village or Doha Bay. It features an oriental décor and air conditioning. Includes a spacious living room with flat-screen cable TV and a minibar. The marble bathroom has a deep-soaking bath and rain shower. These luxurious rooms feature secluded terraces with views of the village courtyards and gardens. This elegantly decorated suite features views over the garden. It includes a flat-screen satellite TV and a mini-bar. 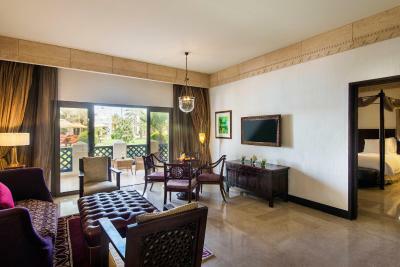 Decorated after a sheikh’s palace, the spacious Royal Villa is divided into 2 distinct wings. One wing includes the suites, while the other has seating areas, a study and a dining room. This large suite has a balcony with sea views. It features a wood chest, lanterns and furniture. It has a sitting area with flat-screen cable TV and a minibar. 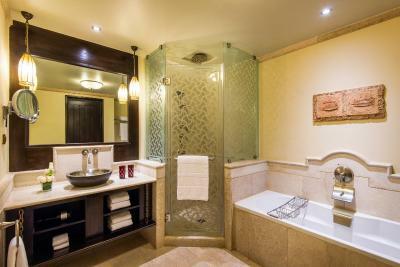 The private bathroom includes toiletries, a bathrobe and slippers. 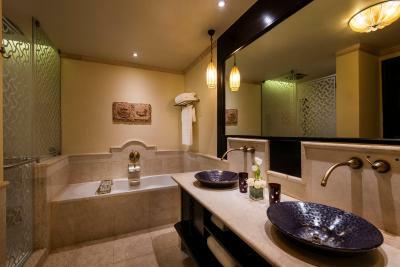 The luxury villa perfectly blends traditional architecture and design with the latest in modern comforts and amenities. 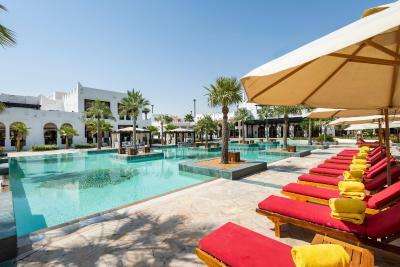 Guests at our luxury resort can glide through the twisting streets surrounding Sharq Village, cool off in the two strikingly constructed pools, recline on an outdoor majlis, or pick up everything from high fashion to precious jewels at the village souq. 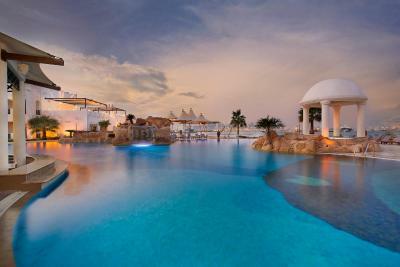 House Rules Sharq Village & Spa, a Ritz-Carlton Hotel takes special requests – add in the next step! All children under 16 years are charged QAR 150 per night for extra beds. Any additional older children or adults are charged QAR 150 per night for extra beds. Sharq Village &amp; Spa, a Ritz-Carlton Hotel accepts these cards and reserves the right to temporarily hold an amount prior to arrival. Sharq Village & Spa, a Ritz-Carlton Hotel accepts these cards and reserves the right to temporarily hold an amount prior to arrival. 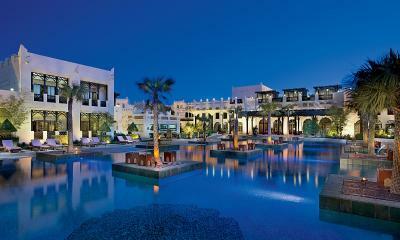 Please inform Sharq Village & Spa, a Ritz-Carlton Hotel of your expected arrival time in advance. You can use the Special Requests box when booking, or contact the property directly using the contact details in your confirmation. Everything was just Magic. From beginning to end. All was more than perfect. That before the smoke came of Ali Baba's teapot, the waiters and other staff could read your mind. That is world class service. The pool was very very busy with ‘day pass’ guests. We paid to stay in the hotel and then couldn’t get sun beds altogether 😔 we were also unable to use the beach area because of jelly fish. Which we understand. It would be good to have a dine in breakfast menu where you don’t have to pay for the full Buffett breakfast. I organised some suprises for the room but they did not atrrive on time and did not help with the overall experience that we had. Everything. It's a piece of heaven. Breakfast buffet might be improved with some touches. There was a construction work above main building and it was noisy at some nights around 03:00 - 04:00, which was not nice. Very attentive, helpful and friendly staff. Concierge team was great as well as F&B team. Luxury hotel but stoped and detained by authorise why I shake hand with some one I knew attending a conference in hotel ..
Beautiful resort, nice arabic style room and facilities ! Nice view of the city. Close to the airport. Very good gluten free options and celiac friendly. Very comfortable bed. Seemed to be near an open air nightclub which kept us awake several nights until 2am. Also seems to be an insufficient number of tables/ chairs in the bar area in the evening when we wanted a drink or they have been reserved, perhaps the bar shouldn’t take reservations?